Today we are bringing you some photos taken from Black Sheep Band Lotto 2018, which was just last night (wow that was quick, wasn’t it)!? There are 27 photos total, check a few out above and below. Last night all seven bands that were drawn took the stage in some form or another (which might be the first time in Band Lotto history that that was the case). Band Lotto Band #3 “EGGMAN” also made Band Lotto history by being the first band to show up to the show with a physical release of recorded material which was a limited run of 25 lathe cut records. The record was “Record of the Night” pictured below. Go check out all of the photos from last night right here. Check out our shows/vids page for more photos taken over the years at Black Sheep. Gordon Chang was also taking video last night and you can probably expect those videos to turn out soon. Activator Magazine was also there taking more photos, so there are more on the way! Tonight we are bringing you a few photos that were taken from Black Sheep Fest 2018 which happened earlier this month on August 11th. This was the 11th Black Sheep Fest we have held at our venue, highlighting local music in Springfield (wow)! Check out a few photos above and below, or head to our facebook photo album here, or our flickr album here. These were taken by Brian Galecki. Activator Magazine’s own Carol Weems also took a good amount of photos which you can find on the Activator Magazine facebook page here. And of course our hero Gordon Chang is BACK at recording videos after a year-long break, with videos of most of the full sets from the fest which you can find on his channel right here. Check out a list of photos and videos from past shows and fests at Black Sheep on our vids/pics page. Today we are bringing you all of those sweet sweet photos from Dumb Fest #6 this past weekend. All of the photos in this batch were taken by Veronica Mullen (who also performed in two bands this past weekend – Ghoul Jr. and Power of Dusk). Veronica shot photos of most of day 2 of the fest (Saturday) at Black Sheep and Skank Skates, also the aftershow at Ms. D’s Kitchen, and at The Old State Capitol the next day. Find all of Veronica’s photos from Dumb Fest 6 right here on facebook or right here on flickr. We also know that new Springfield underground music magazine – Activator took a good amount of photos as well, which you can surely find more of in the upcoming second issue of their magazine. Check out our vids/pics page for a list of more photo albums from past festivals taken over the years at Black Sheep including all of the Dumb Fests. Today we bring you a few photos from our 12 year anniversary show we had for Black Sheep this past weekend! We could not have asked for a better turnout, crowd, or vibes from this year’s reunion show. Thank you to all who came out! Bands Bottom Bracket and Stick People both performed their release shows. Prowess performed with an exercise machine from the future on the stage. Check out a few of those photos below, and head over to our “12 Year Anniversary Show” album on flickr to view them all. Also head over to our vids/pics page to see more photos from over the 12 years at Black Sheep. On the Dumb Fest facebook page right here. On our flickr page right here. In addition to all of those photos, you can also check out videos of the full set of almost every band that played Dumb Fest taken by Gordon Chang of Macomb Events youtube channel right here. 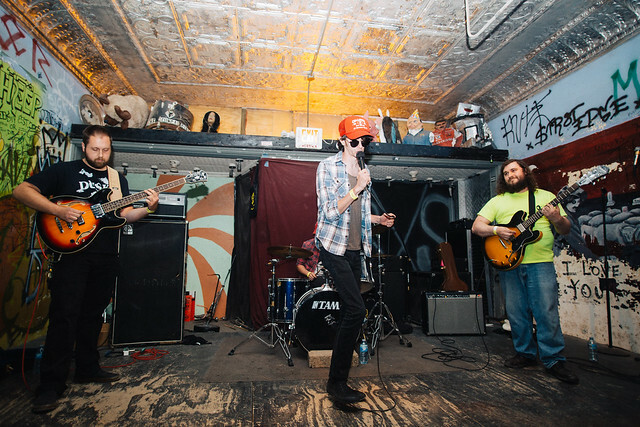 Then we have another close to 100 photos of Dumb Fest from Panoptic Photography right here. Nice! Thank you to Gordon, AJ, and Veronica for all of these photos and videos and thank you once again to everyone who helped make Dumb Fest possible this year. We’ll be back hopefully later tonight with some news on Black Sheep Fest later this summer! It might not be an easy task, but we have been trying our best to gather photos of the incredible Dumb Fest 4-Ever which happened here in Springfield now two weeks ago. The festival happened over the course of three different days on June 10th, 11th, and 12th and 50 bands played at 5? 6? different locations. We have just been grabbing photos as we see them appear, and giving as much photo credit as we can here!! Special thanks to photographers Stephen Houldsworth, Miles Fowler, Austin Roberts, Will Mecca, and B.J. Pearce, and plenty of others. If you took pictures of Dumb Fest that we don’t have, we want to include them in our album! Email us at blacksheepspringfield@gmail.com with your photos. We have started compiling our big album of Dumb Fest 4 photos right here on our Dumb Fest 4-Ever flickr album. You can also find them on the Dumb Fest facebook page soon. Also check out a few below. Check out more videos from the festival and also other videos/pictures taken at Black Sheep over the years on our vids/pics page.